The Compassion Center is extremely happy to announce the addition of Isabelle Dubeau to our incredible lineup of Yoga teachers. Isabelle obtained her certification from the renowned Integral Yoga Institute in Manhattan. What attracted me to Isabelle is her unwavering dedication to teaching traditional Hatha Yoga. It is the purest form of Yoga that is the basis for many of the Yoga classes taught by other teachers. Anyone can learn and practice this form of Yoga. It is especially suited for people who have injuries and/or physical limitations. 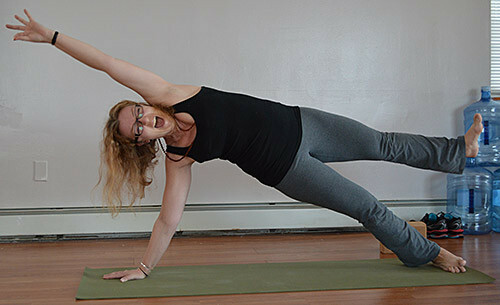 In a time when many are attracted to more physical forms of Yoga, Isabelle’s classes bring an emphasis to the connection of mind and body through the breath. You’ll notice a lovely accent when you first meet Isabelle. Isabelle is from the South of France (a small town close to Toulouse). She moved to Staten Island back in 2001 and now considers Staten Island her home. She has a wonderful smile and an infectious laugh. Beginners will love how Isabelle shows you how to perform each and every posture and gently assists you (with your permission) to correct your posture. Those with physical limitations will find that within a short period, they are feeling better and able to do things that they might not have been able to do before they started taking Yoga classes. If you have never taken a Yoga class before, you will find that Isabelle makes learning and practicing Yoga easy, fun, and life changing. Isabelle will be teaching her Yoga for Beginners and people with physical limitations on Tuesdays from 9:30-10:45am.